Thank you for the info, I still love it. It takes a second to lose, and a lifetime to gain. and it looks lovely with sofrito splashed on it! There, back on track, haahahah! twice as much liquid as rice all at once, or add liquid as needed till rice is done? Kimchee, I just noticed that I hadn't listed the rice on the ingredients list. I just went back and added it. For the short grained Valencia rice (which it the most traditional), I don't use 2:1 liquid:rice ratio. It's just a little more than 1.5:1 I add the stock all at once. Giving this a whirl tonight! but didn't bother to capture the "threw the leftovers out" part. the rice right; ours was a bit crunchy even after MUCH longer cooking times. Paella.. I ain't done with you yet... I will conquer! LOL! I'm sorry that happened, Kimchee. It sounds like one of 2 possibilities. Either you needed more liquid (I had 61/2 cups stock and 1 cup wine for 4 cups rice). Or the heat was too high and the liquid evaporated/boiled away before it could be absorbed into the rice. It you think that was the case, try putting aluminum foil over the pan after the liquid is added to help reduce the evaporation and better 'steam' the rice. Did you use a nice short grain rice, like valencia or arborio? I'm not sure what you expected in the flavor profile. Both the saffron and the chorizo are strong flavors, and will dominate. Some people aren't crazy about saffron. Try cutting it in half. Yeah, used arborio rice, I think the evap too soon was an issue. Didn't use a lot of chorizo; my wife isn't a big fan. My crusty bottom was wayyyy too crusty, so I definitely have rice cooking issues. As for the flavor, I am gonna go find me a restaurant that does good Paella, then I will have a flavor note in mind. Actually, wife is going to such a restaurant soon, and will report on what we were missing. All in all I am quite satisfied with the results... I have a cooking goal, confirmed that the inexpensive "mixed seafood" bag from the Asian market is quite edible, and had fun cooking the meal! It was edible, just not worthy of repeating.......... yet. It was edible, just not worthy of repeating.......... yet. Interestingly, I had Paella at two different restaurants in the Dominican Republic in February, and both times the flavor was lacking. For such a beautiful dish, it lacked any memorable flavor that would leave you saying "WOW!" But, that was the case with most of the foods we ate in the DR, and have heard the same from friends who have also been there, but at other resorts than we stayed at. Looking forward to seeing your wife's comments here. Love paella! But never attempted to make it. Looks absolutely wonderful! Thanks for the thread. About once a year I have a Paella Party, by request of my friends. This year we did it on the grill, the traditional way, and I promised a tutorial on how to do it. So here goes. Made the traditional way – over the grill. You'll think you're in Valencia! This recipe is for a very large pan (18 inches). It will serve about 16 people with bread and a salad on the side. I’ve listed what I used this time, but lobster, calamari, scallops, fresh fish and even rabbit are all great ingredients in paella. There are no rules – just add whatever you like. This is not a quick and easy dish. The cooking will take 2-3 hours, and becomes the center of the party. Bring the pitchers of beer and sangria outside and have the party around the grill. Mise en Place - You really can’t do this ‘on the fly’. You have to have all your ingredients prepared ahead and ready. 2. Peel and devein shrimp. Toss with 2 tablespoons oil, 2 teaspoons garlic, ½ teaspoon each salt & pepper. Cover and refrigerate until needed. 3. Cut chicken thighs in half. Season with salt & pepper. Set aside. 4. Seed and slice red pepper pole to pole in 1/3 inch strips. 5. Cut chorizo into ½ inch slices on the bias. 7. Chop tomatoes into ¼ inch dice. 8. Scrub and de-beard mussels. Return to refrigerator until needed. 10. Cut each lemon into 8 wedges. Pick out seeds and trim ends. I plan to make some Paella, but about have of the seafood is going to be left out of it. Too much and too expensive! Cheap seafood option: Frozen bag of mixed seafood from a local Asian grocery store. About $5 for a bag of squid, shrimp, clams, white fish. That's what I used. Good stuff! I LOVE that mix bag! Makes the best stir-fry recipes! Now you've got me craving that. I'll have to get a bag soon!! I am not really a fan of Island lobster and mussels. This dish as you can see had lots of colour but lacked in flavour. This is why we now rent homes on VRBO.Com and cook for ourselves. Welcome back, Norscaner! When haven't heard from you in a long time - glad you dropped in. You're so right. The flavor profile is very different in a Spanish paella and an island paella (Dominican Republic, Puerto Rico, Cuba). One uses saffron, the other annatto. One uses the dried chorizo, one uses fresh. The seafood selection is very different. The valencia rice has a slightly different texture than the arborio. I prefer the Spanish version, but both kinds have their fans. Thanks for sharing yours with us - it's beautiful! Oh that is stunning Sage! I recently bought a paella pan, smaller than yours. I'm allergic to shellfish. and wanted to do one using chicken and maybe some of my homemade sausages. I purchased Arroz Calasparra rice and El Maragato beans from La Tienda online. I've seen several recipes, but was wondering, since you have experience here, if you have any suggestions for a non-seafood paella. Thanks! I'd like to make some Paella, but I don't want all that seafood in it. It would be way too much and way too expensive!! So I'd have to look for a less expensive and smaller amount. Sherm, Time to bring this to the top. I've made more than a few paella's and paella's vary to the cooks that make them, just like a haggis. They do not need to be loaded with seafood. I happen to live in an area rich in seafood so it's not a problem, but they can be made with a combination of chicken thighs and legs, Spanish or Basque chorizo, mussels and shrimp. One can use rabbit, squirrel, or any manner of game bird. The rice I use is bomba rice that is grown in Spain specifically for paella and it requires plenty of fluid. I keep 3 or 4 boxes of low sodium chicken broth on hand as well as a 1.75 liter bottle of warm pinot grigio to add to the rice cooking. I fry the chicken and chorizo first, take off the pan, fry the rice, then add the fluids, saffron and smoked paprika, & veg; meat goes back to the pan and seafood last. Usually I'll fry garlic and onions separately, then add back. I do them camping and for parties and will do one soon. Luckily I live in the Seattle area and can shop at The Spanish Table. They ship, too. The first recipe I ever used was in the old Time Life Spain Cookbook. I have a ton of pictures and will try and find a few to post. Here is a tutorial I did for another cooking forum. I trust you can get some value from it. Here is one I posted off the top of my head for the camping forum. This is what I do and don't really think about it as I've done it so much. after you've done it several times, you put in things that work for you and your tastes. 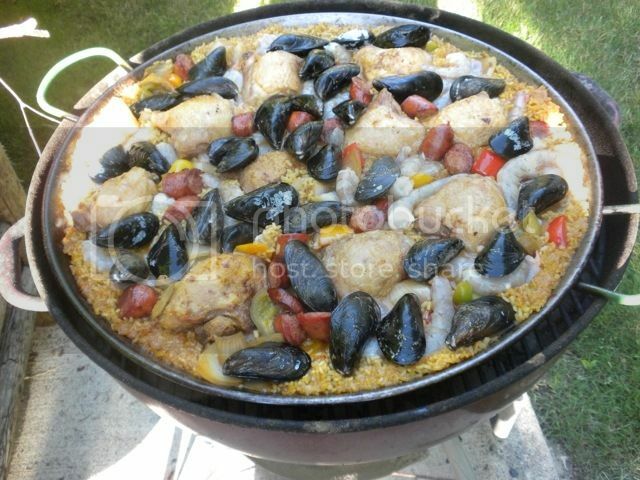 I plan to do octopus and other seafood, and then I'm going to do a rabbit and quail paella during hunting season. Paella is a dish that I fix every time we go to B.C. to fish my friends on the North Island. I do it at home, on the Weber, too, and do it for special dinner parties. As you can see, I'm set up for camping as well. We normally do it the second night in camp. Add mussels, clams and shrimp, when they change color and/or open up, add the chorizo and chicken back into the pan, let it heat up a bit and serve. Some people cook the shell fish on the side and add them. Some seafood may not be available. Don't worry about it. There are many variations and some folks don't mix the seafood and chicken. I'm not fussy. I've done this many times so I don't think about it. It helps to have someone prep with you, BTW. When I do this up north, Sandy cleans the fish while I start the paella. When camping I bring some of the veg already prepped to save time. I make a fire in the pit with alder. I then make a charcoal fire, on the side, and add burning alder to the charcoal as I cook the paella. It's good to have the smoke swirl over the paella as it cooks. When the rice is done, it's ready to eat. I get all my ingredients from the Spanish Table in Seattle. They also give out free recipes. They're on the net and do mail order. BTW, it is important not to get the fire too hot when frying the chicken and chorizo. One time I burned the grease and had to start over. I get too overzealous with my fires. On another note, use a good but second press olive oil for the chicken frying. After I take the chicken and chorizo out, I fry the rice in the oil a bit before I start adding the fluids. Here is one I put together from a recipe I got from The Spanish Table and pretty much followed it word for word. I left out some stuff I didn't think important. There are many paella recipes. Originally paella was a dish made in Valencia using chicken, rabbit, snails and three kinds of fresh beans. 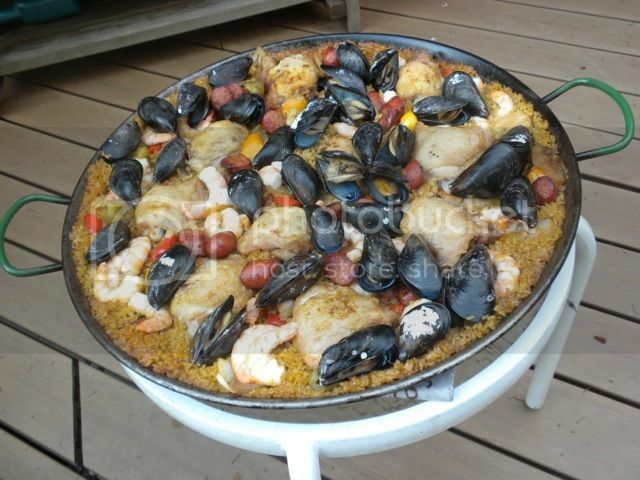 Now paella is associated with seafood, chicken, vegetables and rice. There is no right or wrong way of doing it. It's what pleases you. I do it the way we like it but am not adverse to anything odd in the mix as long as it adheres to certain ingredients. My recipe takes from several different recipes that I have in old cook books. 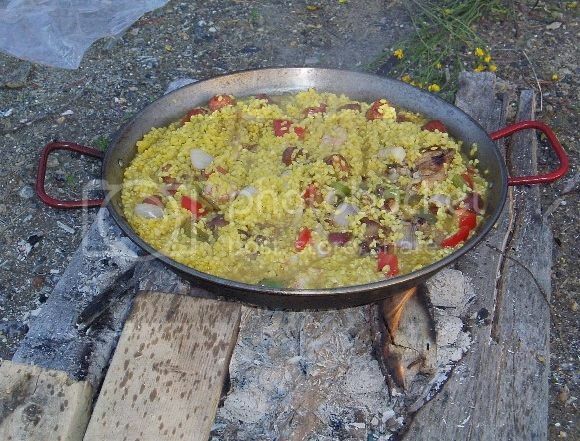 Traditionally paella is not stirred the second half of cooking time. This produces a caramelized layer on the bottom of the pan considered to be the best part of the paella by many. I use charcoal and wood in a weber cooker but most people use a stove. Being able to adjust the heat is important as you don't want to burn the bottom. When i do it on the ground while camping makes it easy to add more wood and charcoal. I read an article where a chef in Seattle cooks the mussels and clams on the side and then adds them at the last minute. I take the chicken, chorizo, and veggies out and then cook the rice adding everything back before serving. It can get huge and sometimes I can't get it all back in the pan. I always plan for more shrimp and ask people how many pieces of chicken they want. 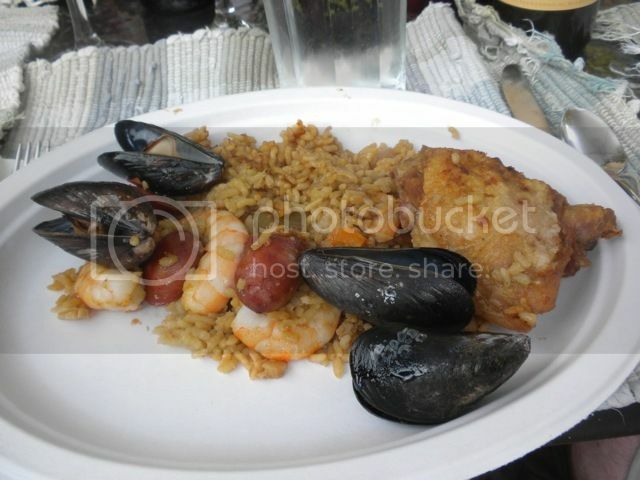 I even take out paella before I add the shell fish as I've had some folks that were allergic or didn't care for seafood. Last edited by Johnny West; 08-24-2015 at 03:53 PM. Here's one I did at an abandoned log dump on the north end of Williston Lake in B.C. There were a bunch of old oak pallets my bud and I used for fire wood. I even took one apart and put the boards on the ground, then made a charcoal fire on the boards - it worked great. This paella didn't have mussels as in north central B.C. mussels are hard to find. We did have some frozen spot prawns to add, though. Spectacular posts in this thread!